You know that old saying, “Opposites attract?” Well that statement definitely holds truth when it comes to describing Lindsay & Daniel. According to Lindsay’s sister Shelby “Lindsay is the small East Coast vegetarian who is the perfect complement to Dan, a tall, blonde-haired, football- and steak-loving Texan.” Clearly, they are a match made in heaven! After meeting in Seattle six years ago, Lindsay & Daniel headed back East and teamed up with Lauren James Events to plan what was to be an unforgettable wedding held at The Logan in Philadelphia. The Allure Films crew arrived at the hotel to capture the heartwarming exchange between the bride and groom during their First Look. There’s nothing like documenting a First Look between the bride and groom before their wedding, and thanks to the magic of film, Lindsay & Daniel can press the rewind button on this moment for the rest of their lives. Cliff Mautner Photography was also on hand to get stunning images from the entire day. It’s always amazing to see everyone come together to transform a hotel ballroom from a space fit for a ceremony to a space fit for a reception. Jamie Rothstein Floral & Event Design were the creative visionaries behind all of the wedding décor elements. We were in awe of the couple’s ivory floral-adorned chuppah. The reception was a big celebration filled with plenty of great speeches and friends and family dancing to Starlight Music. The dance floor was packed the whole night, and everyone had a blast, including the happy couple. Mazel Tov Lindsay & Daniel, and here’s to a lifetime of lots of love and happiness! Contact Allure Films today for more information about our wedding videography services. Allure Films by Video One Productions was happy to be a part of Jamie and Jason’s Westin Philadelphia wedding. They even had a furry friend join them! Cliff Mautner Photography was also a part of capturing the magic from this lovely day. The newlyweds enjoyed an evening of celebrating, dancing, and fatherly advice. The guests rocked out to Eddie Bruce Music all through the night. Jamie and Jason sure know how to throw a party, and Allure Films was surely glad to be in attendance. A big thank you to our newlyweds and congratulations on your marriage! 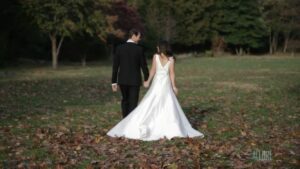 Join Video One for a short preview film from Andrea and Harris’s fairytale wedding at The Westin Philadelphia. Evantine Design transformed this (already) beautiful venue into a gorgeous sea of colorful decor. Cliff Mautner Photography photographed every special moment shared between Andrea, Harris, and their guests. EBE-L.A. Starz played fantastic music all night long that kept the dance floor rockin’. Congratulations to newlyweds Andrea and Harris from Video One. With it’s intriguing historical background, the Cairnwood Mansion provided an excellent location for Laura and Kevin’s wedding. Watch the excitement shared between these lovebirds as their wedding day unfolds. Cliff Mautner Photography caught all the magical moments from this great wedding. Synergetic Sounds kept the crowd on their feet with great music. Become a part of this memorable day by checking out the preview clip below. Congrats to Laura and Kevin from Video One!